11:00 pm That’s it, folks, I’m out. Senate results are still up in the air, of course, as are a few seats – including Indi and Kennedy. Right now Arthur Sinodinos is informing Labor and the Senate that they have no choice but to roll over and repeal carbon pricing because there is not a ‘mandate’. Given that his own Coalition flatly refused to do that on the Emissions Trading Scheme, I find the hypocrisy truly staggering. See you next time, folks. Thanks for sticking with me. 10:12 pm Tony Abbott claims victory, making a point of letting the party faithful know that Labor’s vote is at its lowest level in 100 years. He says that he knows voters will punish those who take them for granted. One wonders if those words will come back to haunt him. As he says his government will be judged by its deeds not its words, Abbott walks back from any hint that the Budget will be in surplus before the end of the next Parliament. There are huge cheers in the room as he goes over his campaign talking points – repeal ‘carbon tax’, stop the boats, build roads. The mining tax doesn’t get a look in. 9:50 pm Kevin Rudd concedes defeat, saying he wishes Tony Abbott well. He thanks each losing ALP member for their service, along with members of his former ministerial and campaign team. It’s an exceptionally gracious speech. Oddly, this doesn’t sound like a concession speech. Nor did it sound like an announcement that Rudd will step down as Opposition Leader – right up until now. He just confirmed he will not contest for the leadership. Cue the frenzied speculation. And cue the backlash. For goodness’ sake, former Prime Minister Julia Gillard – arguably, the person with best cause to be viciously angry at Rudd – was able to be gracious and congratulate Rudd and his team. Pity the voters who are so vocal in her defence can’t take a leaf out of her book. 9:24 pm The knives are out. Jason Clare says Rudd should resign as Opposition Leader, Combet blames him for pretty much everything (possibly including the extinction of the dinosaurs), and even Kate Ellis is talking about ‘putting the disunity behind us’. Tanya Plibersek gave her own party ‘0/10 for governing ourselves’. On another note … think about this, folks. Barnaby and Palmer in the House. Together. At Question Time. 8:20 pmLooks like the Coalition will also control the Senate. 7:45 pmMal Brough has won the seat of Fisher. Well done, that electorate – your new Federal representative is an admitted liar and a perjurer. 7:10 pm Only about 5% of the vote counted on the east coast. At this stage, Rudd looks to hold Griffith, Mike Kelly the bellwether seat of Eden-Monaro, Bob Katter Kennedy, and Wilkie Denison. Palmer looks as though he may take Fairfax. Contrary to initial exit polls, Sophie Mirabella looks to win Indi comfortably. The ABC’s Antony Green has called the election for the Coalition. 7:00 pm Seems there’s something not quite right with the ABC’s vote calculator this year. So far, Antony Green has rejected the numbers on over five seats, saying they cannot possibly be correct. 6:40 pm There’s 0.6% of the vote counted in some seats, and already the commentary is handing them over. Makes you wonder why you vote, really. Amusingly, when the initial tiny swing was towards Labor, it was summarily dismissed. And no one can cope with the fact that the Palmer United Party is polling significantly – ahead of the Greens in Hunter, for example. 6:00 pm Polling places on the east coast have just closed (with the exception of those in Caulfield North – getting an early train home, are you? Must be nice to be so cavalier about being available for people to vote as you are supposed to be until 6:00 pm. Let the counting – and the drinking – begin. 5:10 pm Getting reports from voters in Elsternwick that two polling places are already closed – 50 minutes early. The places in question were in Caulfield North. Door locked, banners pulled down, lights off. 4:40 pm The language from the media is getting more and more ridiculous. ‘Pools of Labor blood on the floor’ is among the milder epithets. Michael Kroger, self-described Liberal Party powerbroker, has called the election. Guess who he says has won? Exit polls are flying thick and fast. Sophie Mirabella defeated in Indi! Kevin Rudd defeated in Griffith! Kevin Rudd landslide in Griffith! Clive Palmer actually gets votes! And there’s still just under 90 minutes to go. Imagine the frenzy when the counting actually starts. 3:10 pm It occurs to me that too many in both politics and the media view achieving government as a reward. It’s not. It’s a responsibility. You’re there to serve the people, not gratify your ego. And on a similar note, some informal vox pops down at the local voting booth, supermarket and liquor store (yes, I’ve laid in supplies) reveal a disturbing ‘what’s in it for me’ trend among voters, too. Their primary complaint against either major party is that there’s nothing in the election promises for them, in terms of money. When did we become such a selfish lot of bastards? Why is it such a hard thing to see that a benefit to someone in dire need (such as Disability Care) actually helps us all? Finally – if you’re looking at the major parties and thinking, ‘Well, Kevin’s had a turn, now it’s Tony’s’? You need to take a step back and realise you’re not policing the slide in the playground. 1.00 pm I have to say, I admire the restraint of all those Labor candidates who are being fronted by media and told they’ve lost the election. Some of the reporters are so smugly patronising when they ask the candidates how they feel. It honestly would not surprise me if someone hauled off and said they felt like jamming an exit poll into an unmentionable part of some journalistic anatomy. Meanwhile, some media actually seem surprised that people are reporting having voted for the Palmer United Party. What’s the matter, kids – doesn’t your worldview take in the idea that people don’t want to settle for a nice, neat, two-party system? On average, you spend ten minutes a year voting – including council, state and federal elections. Ten. Minutes. You spend longer standing in line waiting for your coffee in the mornings. And what do you get for giving up that time? The chance to actually participate in how your nation is governed. And don’t give me that nonsense about, ‘oh, but it doesn’t make any difference’. It does. Every vote counted makes a difference. That’s what turns a safe seat into a marginal one. That’s what causes upsets like Prime Minister Howard losing his seat in 2007. And – if you are someone who looks at the major parties and thinks, ‘a plague on both your houses’ – every first preference vote cast for a minor party is money in their campaign warchest for the next election. That’s how a party like the Democrats, and later the Greens, went from being a curiosity to a force in politics. You get a vote. You get a say. You have opportunities that people in other countries can – and do – die for. Also, you get a sausage. So stop whining, already. 11.30 am Having done my democratic duty, I can report that the sausages at Kingsbury Primary School at top-notch. As for the egg-and-bacon wraps … well, I’d post a picture but they were too delicious for me to stop eating long enough to get out my phone. 10:10 am Good morning, all. The polls have been open on the east coast for two hours, and just opening now in Western Australia. (Hellooooo, over there!) I see that the ABC – with its panel of infallible psychics – has already called the election for the Coalition, so I guess we can all just stay home. Vote early, but vote late, but get out there and vote. Yr obdt. 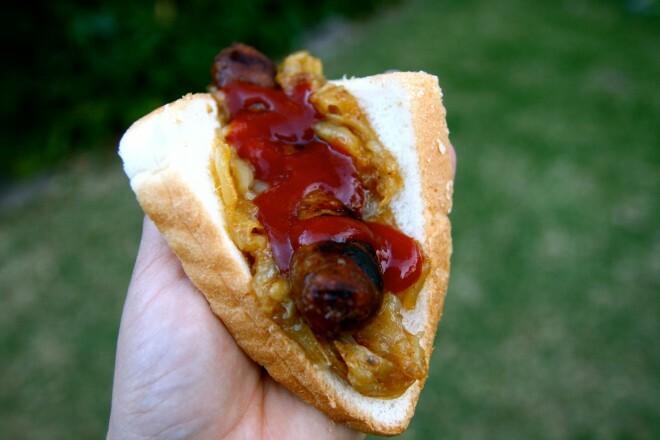 correspondent will be venturing out to investigate the state of the sausage sizzle at the local polling booth soon. With under 24 hours to go, pretty much all that can be said about this election has been said. The media know this; they’ve run out of new questions. They’re reduced to repeatedly asking Prime Minister Kevin Rudd if he’ll stay in Parliament after his apparently inevitable defeat, and how long before Abbott repeals the ‘carbon tax’. Oh, and how Margie will like living in the Lodge. Of course, what they are not asking – and for the most part, have not asked – is how the Coalition can justify handing out middle and upper class welfare dollars to those who least need it, while cutting funds for vital public transport infrastructure and for indigenous legal aid. They’re not asking how the Greens plan to force a majority government of either stripe to go along with their policies. And – with the notable exception of the Wikileaks Party debacle – they’ve ignored the minor parties altogether. Instead, the News Ltd media this morning gave us a full-page photo of Abbott in close-up with the Australian flag behind him. The headline? ‘IT’S TONY’S TIME’. Nope. No bias there. It has to be said, though, that it’s one of the Murdoch empire’s milder headlines. At least they managed not to Godwin themselves. One notable exception in the lacklustre media coverage was the revelation last night that the Coalition had a hitherto unannounced policy for an opt-out internet filter. Broken by the ABC’s Latika Bourke and ZDNet’s Josh Thomas, the news sent the Shadow Communications Spokesperson, Malcolm Turnbull, into frantic damage control. Turnbull’s attempt to quash the story failed miserably when the policy was discovered on the Liberal Party’s website, Taylor published the audio evidence, and Bourke pointed out that Paul Fletcher (Turnbull’s junior) had walked her through the policy in detail. On The Project, Joe Hockey was blindsided. By 8.00 pm, the official line coming from the Coalition was that the policy – which was an old memo, never adopted – had been published in error by an unnamed staffer. An alternative version also popped up, stating that the policy had been ‘badly worded’. Whatever the truth, the news was clearly damning. Whether that makes any difference to the vote, however, is another story. Arguably, the Coalition were never likely to attract many ‘net voters’, anyway – but at least it made the news. Barring another such policy explosion, there’ll be little more coming from either major party before the polls open. With such a short time to go, however, there’s still time to read up on the parties, their policies, and some notable commentators in the independent media. On the mythical beast that is the Coalition’s ‘costings’, Greg Jericho has a ripper of a piece over at The Guardian. Jericho points out what virtually no one in the major media has bothered to mention; what was released yesterday was not costings. It was a short document with few numbers, no detail and none of the bottom-line working-out that should be made available, presented to journalists ten minutes before the media conference. And we’re all supposed to take it on faith that the Coalition got everything right. For in-depth analysis of the parties and group tickets, particularly in Victoria, Cate Speaks is your go-to blogger. If you can think of a party contesting this election, Cate’s put them under the microscope and turned the magnification up high. Another very good site for summary and analysis, particularly of Senate candidates, is Butterfly’s Wings. Merinnan also looks into each party’s preferences, and where an above-the-line vote is likely to end up. Over at the ABC, Antony Green’s Election Guide will take you around the country and show you every electorate in detail. (Okay, so it’s not independent media, but it’s an indispensable guide). And for the policies themselves, here are the links to the websites, in alphabetical order. If I’ve forgotten anyone, please comment and provide a link, and I’ll update this post. Finally, there’s Below the Line, which I cannot recommend highly enough. It provides a simple, user-friendly way for everyone to tackle those ridiculously long Senate ballot papers. In this election, with so many minor parties and with the looming prospect of both Houses being held by one party, voting below the line is more important than ever. So that’s it, folks. Please, take some time, read up on the policies and some of the excellent analysis that is out there. Your vote is more than important – it’s crucial. Tomorrow I’ll be live blogging and tweeting from early in the day. Please ‘call in’ with sausage sizzle reviews, dodgy tactics and dirty tricks (photos gratefully accepted), exit polls and anything else you see happening around town. It’s all up to us now. Let’s do it. How could I forget the most crucial website of all? The Election Sausage Sizzle Map, for all your sausage, cake stall and school fete needs on Election Day – all those small, but necessary things that sustain us all. Where would we be without them? Sausage sizzlers of the nation, I salute you. And I’ll have mine with onions and tomato sauce, thanks. First there was Labor’s Papua New Guinea Solution. Then there was the Coalition’s ‘Pacific Solution 2.0’. Both were harsh, and both rightly attracted criticism from asylum seeker advocates, human rights organisations and the public. Now the Coalition’s one-upped itself, with today’s announcement targeting the approximately 30,000 asylum seekers currently in detention – or, as Liberal leader Tony Abbott called them, the ‘old arrivals’. ‘Illegal arrivals … if you can’t stop the boats, you’re not capable of governing this country … stop the boats … stop the boats … 30,000 who have come illegally by boat … we’ve always said people who come illegally by boat will not be granted permanent residency … those who come illegally by boat will get Temporary Protection Visas … come illegally … people who are here illegally by boat’. That was in less than three minutes. Not that this has ever deterred the Coalition from pushing their lie. And yes, it is a lie. Coalition members, including Abbott, have been repeatedly informed of the truth, and deliberately choose not to speak it. The Coalition apparently decided that putting in place new policies to deal with further arrivals wasn’t enough. It announced retroactive strategies aimed at clearing out what it described as a ‘legacy backlog’ of asylum seekers waiting in detention centres for their claims to be processed. Kicking off with a paraphrase of former Prime Minister John Howard’s infamous slogan – ‘This is our country and we determine who comes here‘ – Abbott described what would happen to those 30,000 people (who, he asserted, were hoping for a Labor victory so that they could settle here permanently). Their claims will be ‘fast-tracked’, under a ‘triage’ system. What that boils down to is that after a fast pass, anyone who might not be granted refugee status would be quickly processed, have their claim looked over and then ‘put on a removal pathway’. This includes anyone in community detention; if, during ‘triage’, they appear likely to be denied refugee status, they would be immediately returned to detention centres. After that, ‘likely’ claims would be processed. Anyone finally granted refugee status would be given a Temporary Protection Visa for up to three years, assessed on a case by case basis. For the entirety of that time, TPV holders who were granted a welfare payment would be required to be in a Work for the Dole program. They would also be denied family reunion. When their TPV expired, their refugee claims would be assessed again and if a Coalition government decided they no longer had any fear of persecution, they would be deported. The final part of this ‘streamlined’ process would be the abolition of the Refugee Review Tribunal. Abbott noted that under the current system, 80% of those initially denied refugee status had their cases overturned on appeal. ‘That’s why Australians are questioning whether this a fair system,’ he said. In response to questions, Abbott said he was confident that this plan, together with Operation Sovereign Borders, would see the number of boats drop to three per year by ‘well into’ his first term, certainly by 2016. He described this as ‘the happy situation that was brought about by the Howard government’. There is nothing, nothing happy about this. This is a system designed to do only one thing; kick as many people as possible out of Australia. It’s not intercepting a boat and processing asylum seeker claims offshore, or even settling people offshore. It’s targeting people who are already here. And why? Purely so that the Coalition can say it’s ‘fixed the boat problem’. Not only will they stop the boats, they’ll punish those who already got here by boat. Asylum seekers would be entirely at the mercy of a system for which there is no independent oversight, no independent review, no recourse to even the most basic of rights. DIAC would not have to prove that someone deliberately destroyed documents; it would be enough to be suspicious. The ‘fast-track’ process (which Abbott likened to the system under Howard) virtually guarantees that grievous mistakes will be made, potentially sending people back into situations that would endanger their lives – but neatly avoiding the accusation that we are breaking our non-refoulement obligations, because after all, it was a mistake. Oops. Remember Cornelia Rau? OrVivian Solon?? They were just the high-profile ‘mistakes’ under Howard’s plan. Even if someone is found to be a refugee, they would have no opportunity to build any kind of life here in Australia. Assuming they would qualify for welfare, they would need to work for the pittance they’d receive. (Funny thing – if you have to work for it, it’s hardly welfare.) It sets up a whole new lower class who would be dependent on relatives or charity organisations just to survive. Perhaps they could serve in Abbott’s Green Army. The Coalition knows what it’s doing. Morrison said, ‘We want to end the process where “no” becomes “yes” under an appeal’. You read that right. The Coalition doesn’t want there to be any chance that a decision made by DIAC might be found to be wrong. Morrison added, ‘The UNHCR says you don’t have to have both judicial and administrative processes’. The Coalition wants to go back to a pure administrative system; ‘it works better for us,’ said Morrison. ‘We’re not obliged to give [asylum seekers] the same rights as we are our citizens’. There you have it. And while it’s possible there could be more inhumane asylum seeker policies, short of actually locking people up in the equivalent of Abu Ghraib, it’s hard to see how. And yet Scott Morrison says the Coalition will deal with people ‘in accord with basic human decency’. And yet Tony Abbott says the Coalition will ‘discharge its humanitarian obligations’. This plan is neither ‘decent’ or ‘humane’. And for Abbott to describe it as bringing about a ‘happy situation’? Prime Minister Kevin Rudd visited Governor-General Quentin Bryce today to request that she issue writs for an election of the House of Representatives and half the Senate. The date will be September 7, and the campaign begins tomorrow.